Hey, I just wanted to give everyone a preview of some of the great stuff we've got planned for next week, so that y'all don't give up on us! On Sunday afternoon/evening (depending on whether or not I go up to the Twins game) I'm going to be publishing an extensive Twins Draft Preview, with information from Baseball America, mlb.com, and various other sources. The draft is Monday afternoon, so I would encourage everyone to come check out the site before then so you are up to speed on what route the Twins might take. Also, John and I are both going to have creative entries posted sometime next week, as we've got a few very good ideas cooking. I have a feeling that Monday is going to be a busy day here at Twins Chatter, so you don't want to miss it! Hey! The Twins even pulled out a victory tonight! Does it get any better? 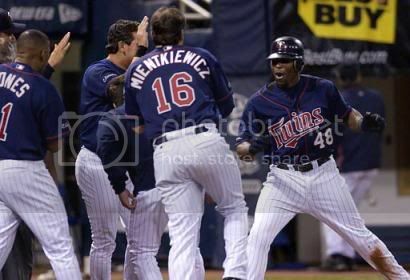 Torii celebrates after his walk-off homer gives the Twins only their 5th victory in their past 15 games.